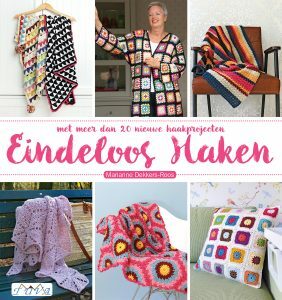 The Dutch version of this pattern can be found here. 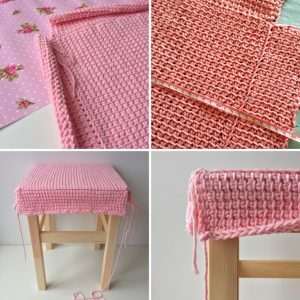 This stool cover is crocheted using the tunisian crochet technique – as explained in these tutorials here and here. 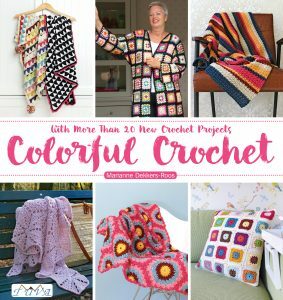 First, we’re going to crochet the top of the cover. 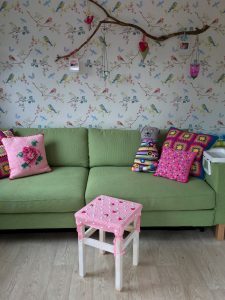 If you’re using the “OddVar” like I did, you’ll need a square of 33cm x 33cm. 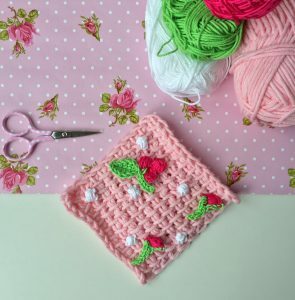 Making a 10cm x 10cm swatch is a real good idea – you’ll know exactly how many stitches and rows you’ll need for your stool cover. 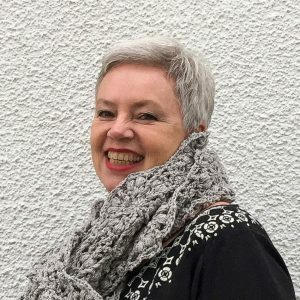 I chained 38 stitches and crocheted 34 rows, after which I blocked my slightly curling piece of tunisian crochet. After that I crocheted the 4 side pieces. 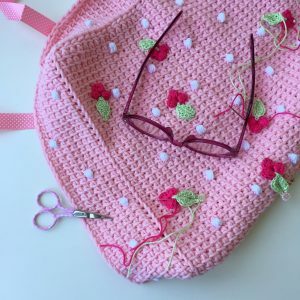 I picked up my 38 stitches again, making sure to crochet through the backloops only. For the two side pieces I needed to add 4 stitches in total, so I increased 2 at the beginning and 2 at the end of my first rows. The side pieces all count 7 rows; after they were ready, I – again – blocked my crochet and hand stitched the short sides together to create 4 corners. 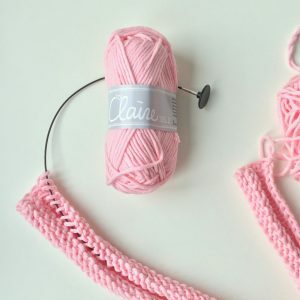 Switch to a regular hook and your white cotton. 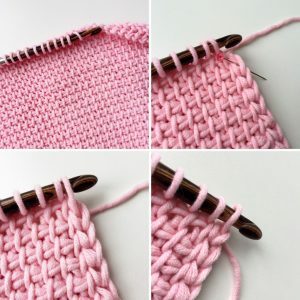 Slide your hook under two horizontal stitches/bars; pick up a loop, yarn over, go back under the two stitches, yarn over, pick up a loop – repeat this until you count 9 loops on your hook. Yarn over and through all 9 loops; close with a slip stitch. 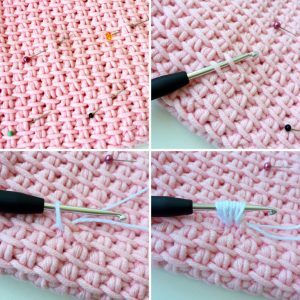 Pull both yarn ends tight – sew in at the back of your tunisian crochet. 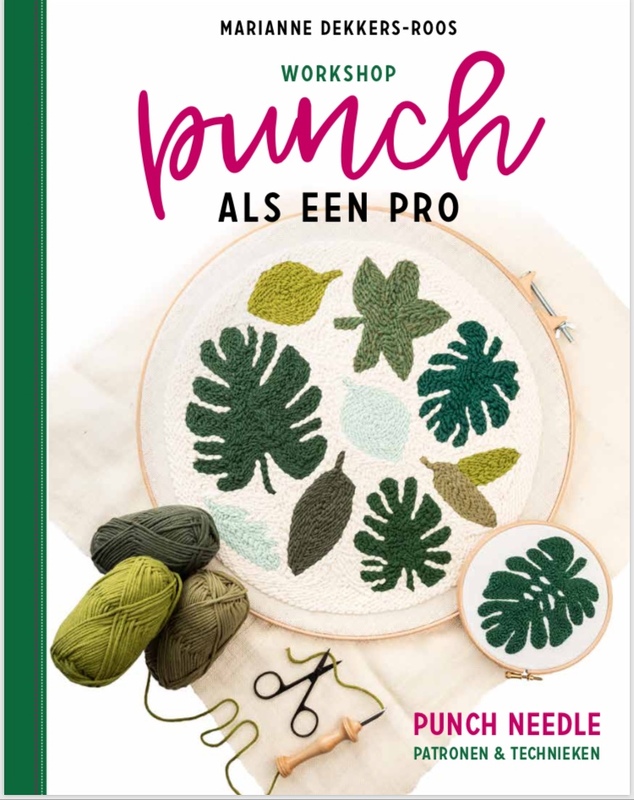 To evenly crochet the little dots onto the cover, I made sure I had 5 stitches (horizontally counted) as well as 5 rows in between my dots, but you can – of course – do whatever pleases your eye. 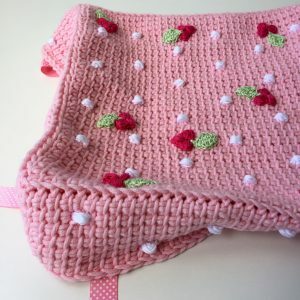 With your regular hook and the fuchsia/pink cotton you chain 5; slip stitch in the 1st chain to form a circle; * in the ring you crochet a 9-loop puff stitch (done exactly like the little dots you just made), chain 3, slip stitch into circle **; repeat from * to ** 2 more times – total of three puffs in circle; leaving long yarn ends makes sewing your little flowers onto the cover easier. 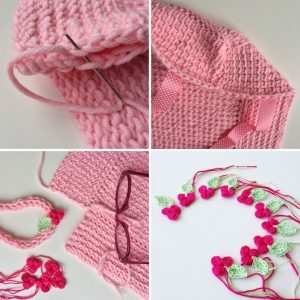 Attach the light green cotton into the circle with the 3 flower puffs; chain 7; starting in the 2nd stitch from your hook, you crochet: 1 slip stitch, 1sc, 1hdc, 1dc, 1hdc, 1sc; continue on the opposite side: 1sc, 1hdc, 1dc, 1hdc, 1sc, 1 slst; fasten off – leave long yarn ends. Pin your flowers onto the cover – spread them out evenly in between the little dots. I made 9 flowers&leaves and used their long yarn ends to sew them to the crochet. Lastly I stitched 2 pieces of ribbon to each of the 4 corners, so as to keep the cover nicely in place.